Scientists anticipate another record setting year for temperatures in 2016. 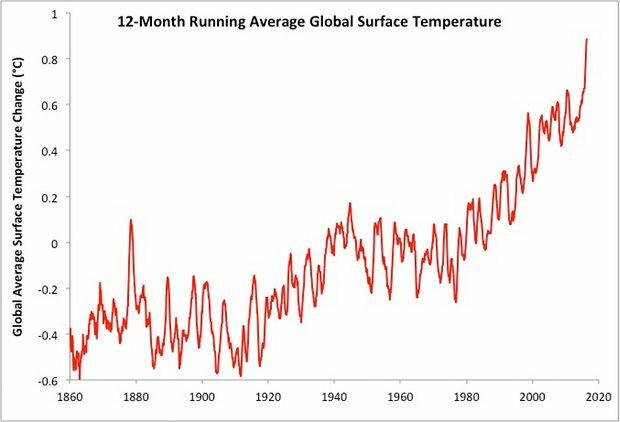 Since we began tracking surface temperatures 150 years ago, 2014 and 2015 set the record for being the hottest years ever. And now, as we barely pass the halfway mark of 2016, it looks like we’re about to break the record again. The temperatures that have been experienced globally were partially brought on by a strong El Niño event causing the ocean surface to warm up, leading to a temporary warming of surface temperatures. Add this phenomenon to human-caused global warming, and the result is record-breaking temperatures unlike anything the world has seen or experienced before. A similar El Niño event took place between 1997-1998, but those figures, which broke records at the time, are now in 60th place. Since then, temperatures recorded in 2005, 2006, 2007, 2009, 2010, 2014, 2015, and 2016 have gone beyond it. In most of the years mentioned, the warm temperature wasn’t even simultaneous to an El Niño event. To date, global surface temperatures are now over 0.3 degrees Celsius hotter compared to what they were back in 1997-1998—a very significant rise in over 18 years. According to studies, Earth is warming rapidly following a rate of 20-50 times faster than the fastest rate of natural global warming. Despite the El Nino phenomenon of the year just ending, it still looks like 2016 is poised to break the record as Earth’s hottest year. As a response to this, 195 countries have since pledged to make big efforts to lower carbon pollution and shift more focus towards climate and energy policies.